Not long ago I published a Review on Infinix Hot Lite (X557) which is the lightweight version of Infinix Hot 5 (X559). This review quick skyrocketed as more searches kept coming in. And now, based on requests, I have obliged to review the more tailored version of the Hot 5 series. Whether you like it or not, Infinix has become strong competitors in the mobile phones industry. This is evident in the number of searches for their products and buyers. You might begin to wonder why the quick rise. It's not far-fetched! They have found a way of giving users what they want. Considering the fact that there is a number basic smartphone features an average user desires to see, Infinix has done justice to customers' demands. With high performance-based XOS Chameleon OS, battery optimisation, graphics quality and storage boosting, Infinix phones have it all. 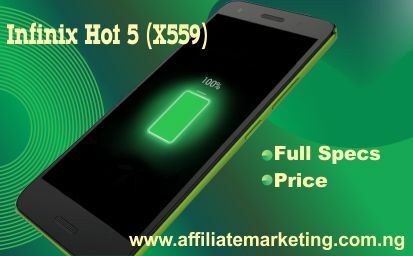 Infinix Hot 5 (X559) is an amazing device with exciting features and delivery rate that meets both the aesthetic and performance needs of most users. With a large battery capacity, the fear of power failure is long buried. Additionally, it presents cutting-edge graphics features to promote social media standards. This device is the best buy for those looking for a not-so-expensive smartphone with all the top features such as 2 GB RAM, Fingerprint sensor, 4000 mAh battery, and an 8 MP camera. How long your mobile device can last matters a lot. Of course, you wouldn't be connecting your phone to a power source every now and then. That's where this device meets up to the task. Boosting a 4000 mAh battery, users can be confident of long hours usage without disappointment. On the average, users are guaranteed a 35 hours talk time on the 2G network and a 24 hours talk time on a 3G network. The standby time stands at a whopping 837 hours equivalent to 35 days. For game lovers, social media enthusiasts and multimedia fans, this is definitely a suited smartphone to enjoy all the fun confidently. 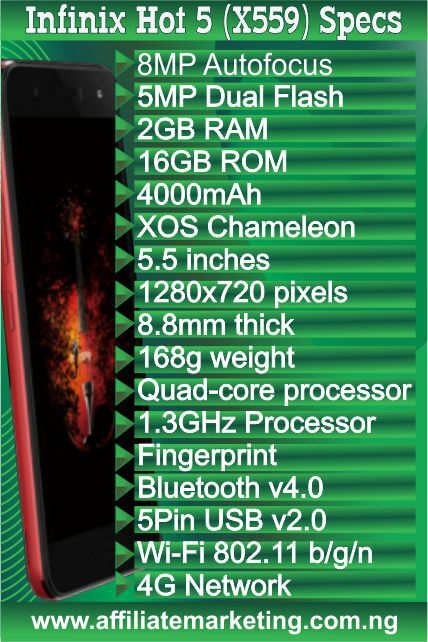 This mobile phone has been built to run on the famous XOS Chameleon Operating System with top performance, optimisation and security features. It is a customised OS based on Android OS, but tailored to deliver flexible user designs and enhance the experience. Additionally, its power management features ensure that 4000 mAh battery functions at a level double its basic capacity. You can read more on this OS here. This device has a rigid structure combined with colourful 3D texture to encapsulate youthfulness, beauty, elegance, and passion. Its slim body design allows for one-hand grasps and further promotes portability. The edges are slightly curved with striking glows that emulates mirrored solar reflections. With five different colour variants of Fine Gold, Sandstone Black, White, Lemon and Red, you have a whole lot to choose from. Looking for a faster and convenient way to secure your device? Then, this device is for you. The Fingerprint scanner improves the security of the device. No more need for long and cumbersome passwords and patterns, just a few seconds of fingerprint sensing does the magic. This feature combines with the Xhide App to deliver unimaginable security control on your files, data, folders, pictures, and other information you store on it. When the question of storage is put forward, I usually consider two aspects, the RAM and ROM sizes. The RAM size contributes the overall processing speed, while the ROM simplify determines the number of documents you can store and applications that can be installed on it. It has a 2 GB RAM to optimise performance and a 16 GB internal storage capacity which is expandable up to 32 GB with a micro SD Card. Though not among the top megapixels camera, this one is enough to capture high-quality pictures and videos. An 8 MP camera with five internal lens elements and multiple shooting modes captures your photos with the finest details. The 5 MP camera equally captures beautiful photos. Assisted by a soft light flash, brightness is replenished for capturing in dim environments. The dual speakers located at the front utilise Dirac Stereo Widening technology to deliver high-impact audio and video contents with pleasant softness and tone. You can choose to have a taste of the high-volume capacity rare in most mobile phones. These features enable users to stream videos and media contents with much clarity and focus. This product is available for purchase in popular online shops and malls. It's price ranges between N36000 to N40000. You can check the following for the price and place an order. Check Jumia Price & Offers. Whether you’re looking for a phone to keep up with the mobile world or some real toy to catch fun with, this phone qualifies either way. You can make your next purchase and join the band of those enjoying the cool features of this smartphone. Order for yours today at Jumia.